I am such a weirdo. Normally on Sunday’s I bake cookies, brownies etc.. but today I was craving Butternut Squash. 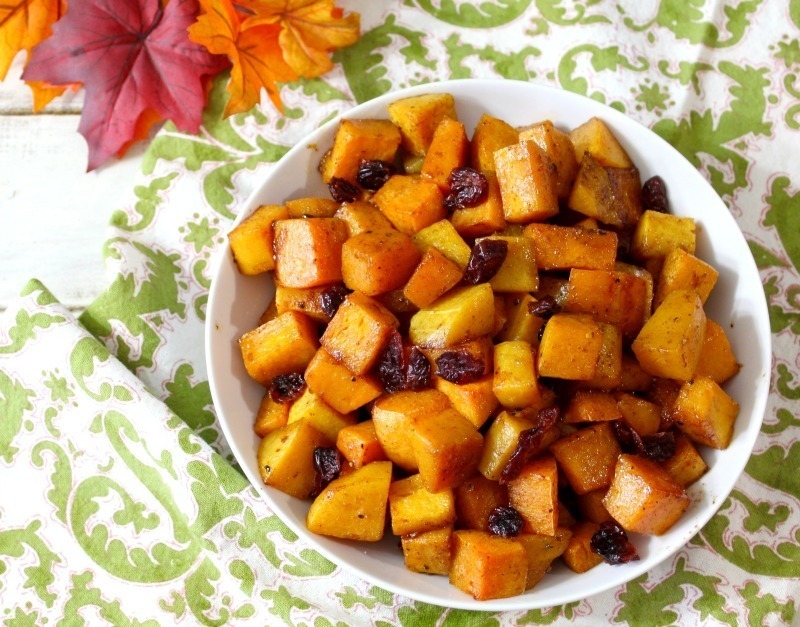 So at 6:30 on Sunday morning, I made the most delicious Butternut Squash that will be perfect for Thanksgiving or anytime of the year. 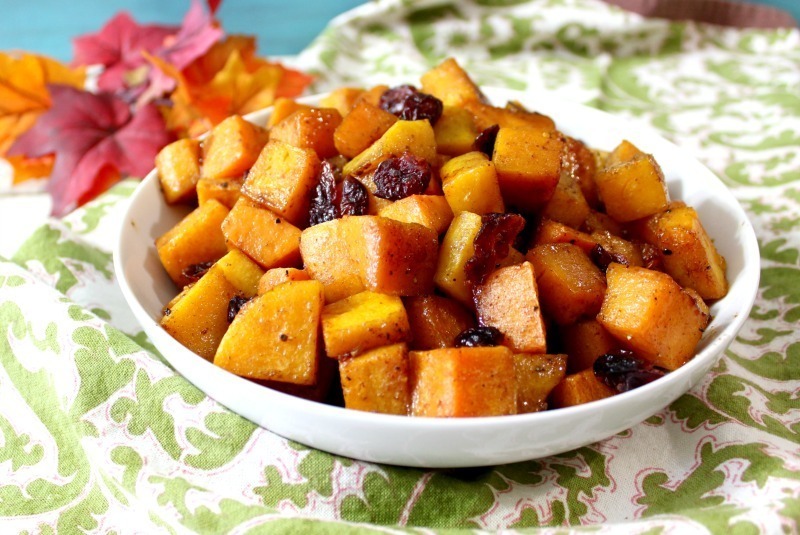 As you can guess it, today’s recipe is Caramelized Butternut Squash. 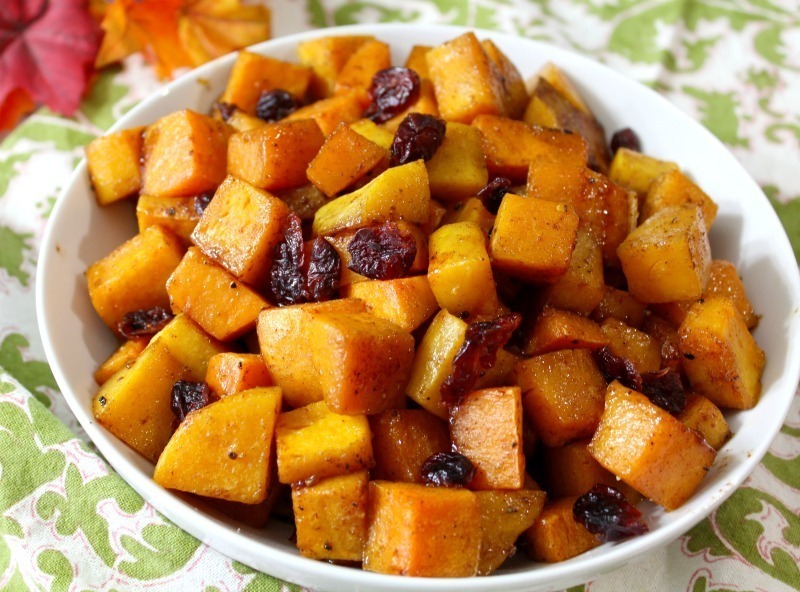 The Butternut Squash is sweet and savory. It is simply perfect in my eyes. It has a sweet maple syrup and cinnamon glaze with just a hint of cayenne pepper for some heat and a pinch of salt and pepper for additional flavoring. It is so good and just screams Fall and Thanksgiving. I must tell you that I didn’t make this for Thanksgiving, but made this for my snacking fetish that I have throughout the week. This will sound weird too, but I love to eat cold Butternut Squash. It is a great snack, full of flavor, nutrients, and fiber. If your craving something sweet, this is the snack for you. This recipe is so easy to prepare. I bought already cut-up Butternut Squash from Trader Joe’s, added it to a bowl and tossed in olive oil, maple syrup, cinnamon, salt, pepper and cayenne pepper. So easy. Then back for 20 minutes, or until fork tender. You can’t really ask for an easier side dish. I normally buy Butternut Squash myself and peel and cut it, but it was so much easier this way. Plus I noticed that the squash didn’t look so great at any grocery store. I will tell you that if you do want to buy any kind of squash, like acorn, spaghetti or delica squash buy it at Trader Joe’s. It is one price for any size and normally under $2.50 depending on what variety you buy. At my local grocery store they sell squash for $1.99 pound, which is crazy considering they are all about 5 pounds. I don’t want to spend a fortune on it, so trust me when I say, Trader Joe’s is by far the best place to by your squash. One price fits all. 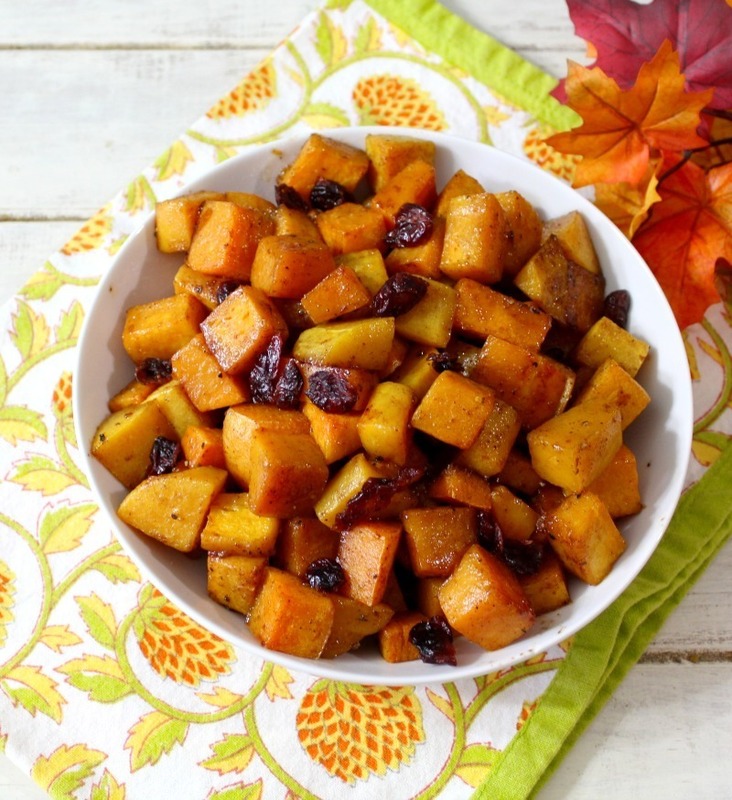 Oven roasted Butternut Squash that has a sweet maple syrup and cinnamon glaze with just a hint of cayenne pepper for some heat and a pinch of salt and pepper for additional flavoring. Line two baking sheets with aluminium foil and spray with cooking spray. 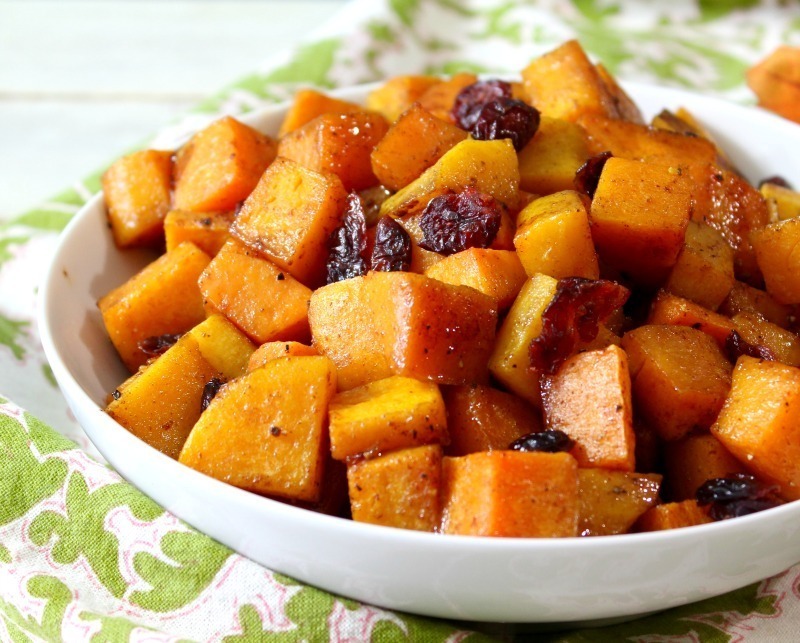 In a large bowl, add all of the ingredients, and mix until all the butternut squash is coated. Divide the butternut squash mixture between the two baking sheets. Place in oven and bake for 20 - 30 minutes, flipping half way through. 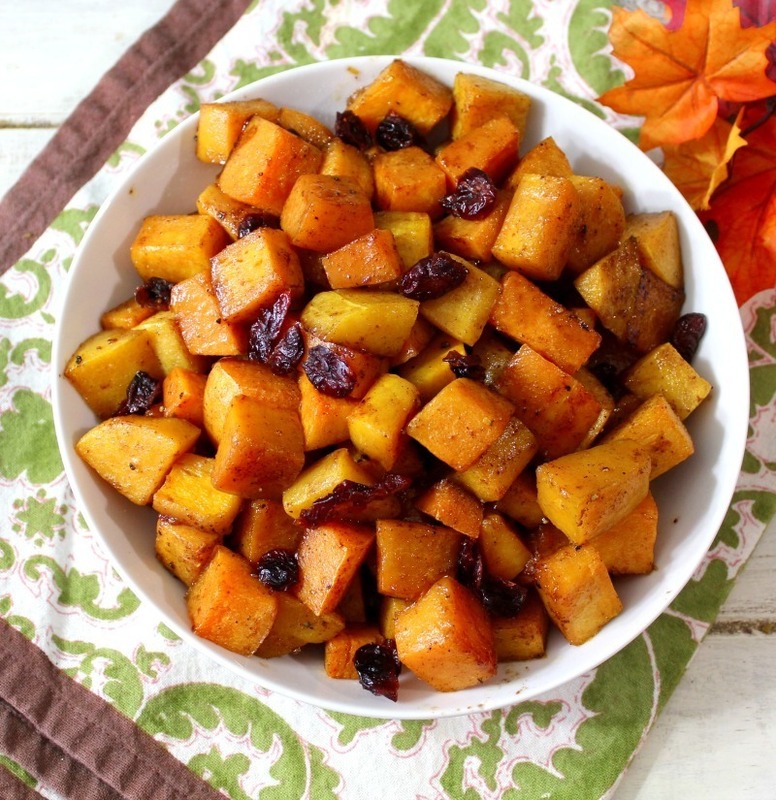 Place in a serving dish and sprinkle with dried cranberries if desired. I think it makes a nice color contrast. Make sure the butternut squash is cut about the same size. The smaller the pieces the quicker it cooks. Funny how excited I get over squash. I have been wanting to make this recipe for week’s but never got around to it. So glad I finally did.